Product code: ES7880 Categories: Sold Items, Sold Rings. Here is such a sweet and charming 18ct antique turquoise, pearl and diamond ring made in 1888 that will always look so good on any finger and will no doubt continue to always be admired. With such a wonderful combination of colours coming from both the natural turquoise and the pearls, they are both highlighted by the diamond sitting elegantly in the centre. The turquoise has the perfect colour that is so desired and at this top section it measures 6.7mm wide by 15mm from one end pearl on one side across to the other end pearl on the other side. This ring has the perfect proportions to suit any hand and feels so comfortable to wear all the time. This is such a charming example of a genuine antique ring from the Victorian era that will bring so much pleasure to the wearer every time that it is on the finger. Tags: 18ct antique turquoise, pearl and diamond ring. This antique ring is typical of the late Victorian era. 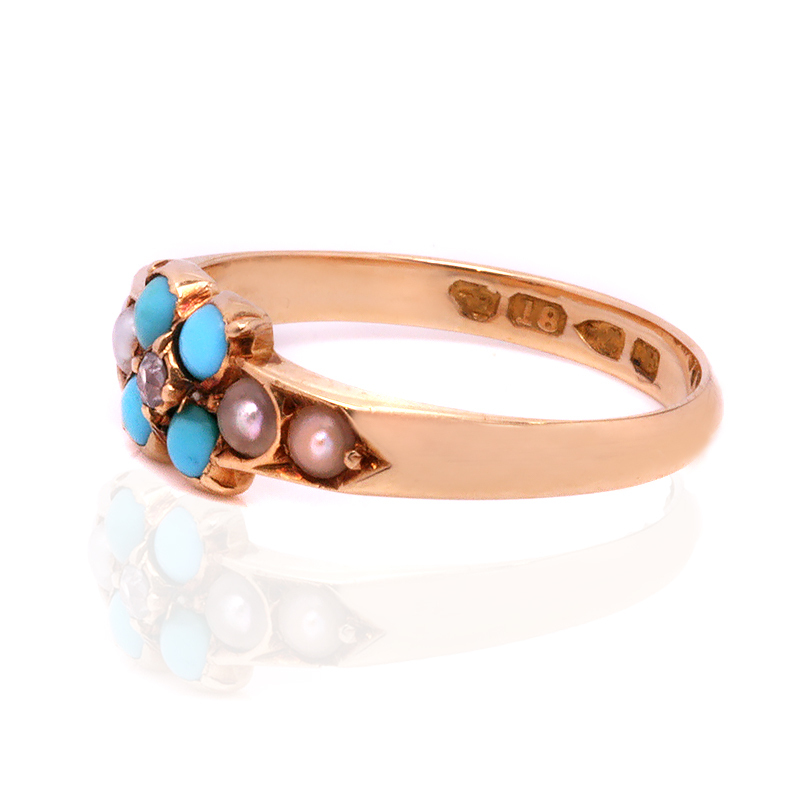 Set with turquoise, pearls and a diamond, it was made in 18ct yellow gold. So easily able to be worn on any finger, antique rings such as this one always look beautiful day or night.